Comparing the two images below, I'd be interested in hearing thoughts regarding footboards on beds. They can make the bed look grander, but of course cost a little more and take up a little more space in the room. If you have them, do they make the bed much harder (or easier) to make? Do tall guests complain about feeling crowded by them? Other drawbacks? "I really don't see many people quitting because my footboards are higher than they like." Good luck with that Arkie. People are lazy and don't want to work, even tho the news says so many people DO want to work. The best part about it is IF you are not hands on, who is checking on their work? I hired someone - twice and both total failures in the cleaning department, I had to do more than they did to start out with! It was way way more work than just doing it myself. I only wish someone would come along and say "I will do this and do it right!" but it is rarely the case. Some of my grumpiest days are the ones when we have new hires. I hate the training, hate having to follow them around and correct them. However, a few weeks into it, not so bad. I like the time it frees up for me. Still, even after years, I do have to go and do spot checks and I am surprised by what is missed. You're right about finding people. We advertise exactly what the job entails and the hours and we get calls for 'front desk staff'. Then the people who will actually do the work can't work weekends and want to come in at 3 PM. I am sorely tempted to ask them when they think they guests arrive? One summer we did have a college girl who loved to clean. The house never looked better! We have both here, the 2 antique beds with footboards are hard to make but two others have low footboards (a little higher than the one pictured) and are easy to make. The plus to having some sort of footboard is the fact of having a place for comforter. It is common thing here to have the quilt or comforter on the floor of the room without a foot board. EVEN though we do have blanket racks in each room. To clarify a footboard ENCLOSED like sleigh bed is what Arkie is talking about right? Other footboards are not an issue, 4 poster beds, etc, I think the sleigh bed high and enclosed footboard look is what we are all on about! 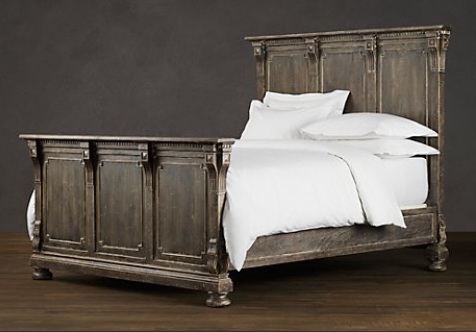 To clarify a footboard ENCLOSED like sleigh bed is what Arkie is talking about right? Yes, enclosed like in the first photo above. But I wish I had mentioned in the question that it would be on a king sized bed (nearly 7 feet long). Also, the bed would be changed by a housekeeper, so difficulty in working with it isn't such a concern for me. I like the look of the high footboard, and adding to the guest's postive experience at my place is more important than convenience to me and the staff (within reason, at least). But the point that it's nice to be able to sit at the foot of the bed is well taken. I might get one high one and do the other rooms with the lower one. Still thinking it over. Still have a few months before time to buy. Today we picked out floor, wall and countertop materials and colors, kitchen cabinetry and lighting. The project is finally to the fun stages! also you have to think about the view of the television from the bed we had a problem with our 4 poster room and the view of the Tv was lined up wrong with the post so you could n't see it properly. So as a tip and this is on the hotel inspectior mark out in the room where everything will go so you can line up all the plugs, light switches and so on makes life a lot less difficult later on. Also put in double the amount of sockets you think you need. For us it was the post that guests (men) had leaned on while getting the spiel - so it was loose and DH pixed it with a dowel rod. A grade school classmate visited and HE is the one who finally told me it interferred with the TV and how to fix it - pick it up and move it to the corner. It is not a canopy bed thank goodness. Yes, enclosed like in the first photo above. But I wish I had mentioned in the question that it would be on a king sized bed (nearly 7 feet long). Also, the bed would be changed by a housekeeper, so difficulty in working with it isn't such a concern for me. I like the look of the high footboard, and adding to the guest's postive experience at my place is more important than convenience to me and the staff (within reason, at least). Let me be the first to say- bad attitude! Your staff's ability to get the job done definitely impacts your guests' experience with you. If your staff all end up with back pain, barked shins and the like, they are much less likely than you would be to quit and go work some place where it's easier to get the job done! You'll be paying the person so the faster they can get the job done, the less you have to pay, unless you're hiring for a set number of hours. Also, the bed would be changed by a housekeeper, so difficulty in working with it isn't such a concern for me. Let me be the first to say- bad attitude! Oh yes, I know. That's why I used the embarassed emoticon after I said it! Horrible thing to say. That's why I give them money for doing the work. I really don't see many people quitting because my footboards are higher than they like. But not an issue now. There will be no high footboards. Happy tall people, happy staff, happy pocketbook! I have a high school kid cutting & edging the grass, pulling out poison ivy and other vines, and trimming my hedges. I pay him $10 an hour. He is rarely here more than 1 1/2 hours, at most 3 1/2 and I always round up. BUT the last time it was cut I did it because he did not come over. I will probably keep him until he graduates but then we will go with a lawn service. $10 per hour is a decent wage here for adults. I don't think you have any idea how difficult it is to find good employees. You may be singing a different tune once opened. We find it immensly difficult to find a great employee and make every effort to keep them happy so they stay. It takes a lot more than just money to get and retain not only good working help but also those who feel proud of the B&B and loyal. And take if from someone who is making her own beds. It is not a matter of "like" with the high footboards. It's also health. I find it hard enough as it is wthout a footboard to lift the mattresses to tuck the sheets and blanket under. It's hard on the hands and wrists. As far as I can see here it is not the young who are willing to work at a B&B, it's the older generation. And I want to keep them healthy and happy as they are the BEST and most LOYAL people ever. I have the most wonderful innsitters who don't balk at anything I throw them and I would be lost without them. Arkie, my baby brother is 6'5", my little/big brother (younger than me but taller) is 7'1", my sister is almost 6'. I am the runt of the family at 5'7". I have had guests who were 6'8". I stand by my statement dump the high footboard. The footboard that does not come higher than the mattress is fine, over the mattress height - no. I stand by my statement dump the high footboard. The footboard that does not come higher than the mattress is fine, over the mattress height - no. OK. That's the overwhelming consensus...like 100%. High footboard is dumped. Tall people win again! Now, what about "eastern" king vs. California king. Eastern is 4" wider. California is 4" longer. My own thinking is that wider wins here. Looking at my fellow Americans, they're getting wider a lot faster than they're getting taller, and need all the bed width they can get! In this case I would go with what you can more easily find bedding for. Footboards are too confining and take extra time to make up the bed. I say the second one would be my choice. And even that one you will have some doing with a shorter footboard. Ark, second bed is definitely preferred for both guests and whoever is making the bed every day. I have a few beds with footboards but they are more like your second picture. Tall folks have a difficult time with a big tall footboard. We don't use footboards. It's much easier and quicker to make a bed without them. In fact, one of our headboards is fashioned from an old pantry door that is actually attached to the wall. I know it sounds tacky, but it actually looks good and we receive a lot of compliments on it. We have one sleigh bed and it is a bear to make up. Our other beds all have footboards, but they are either canopy beds with posts on the corners or the footboards are lower than the top of the mattress. Go with the low footboard, if you have room for it. Also, Madeline is right - pay attention to what the footboard is. We have a bed with a pointy, although low, footboard and I have to wrap a blanket on the corners so I don't carry bruises all the time. I would never buy a bed with a footboard for a B&B. Terrible to make up. Personally the low footboard makes the bed more inviting imo, you can also lay a nice coverlet or spare quilt over the end in season. There is so much more you can do with the bed with linens. With my 1.92m high (tall, but not so tall either), I hate sleeping in beds with footboards. Bad night guaranteed. You just cannot spend all the night with legs folded, you NEED some time with legs unfolded and sleeping in diagonal is unpleasant. It surely is one of the points I check when booking a B&B. I am always surprised to see antique beds, often both narrow and short with footboards, in B&Bs here. we have 3 with a foot board 9 without and you can always fricking guarantee the 6 foot 6 man is in the foot board bed! If they let me know I put them in king size bed rooms as they are 6 foot 6 and have no foot board. however the normal size guests love the footboard beds so its swings and roundabouts. There she goes again! Had to look that one up. I like it! Still don't know where it comes from, but I like the concept. it comes from play parks Swings and a roundabout is a sort of round disk that spins round with chairs in the middle of it. so its what suits one might not suit another. We say '6 of one, half dozen of the other'. but for guests ... no footboard that comes up higher than the mattress. unless you have massively long beds. they just won't work for taller guests. plus it is more work to make the beds. No footboards here. Cannot imagine trying to make the beds with stuff in the way like that. 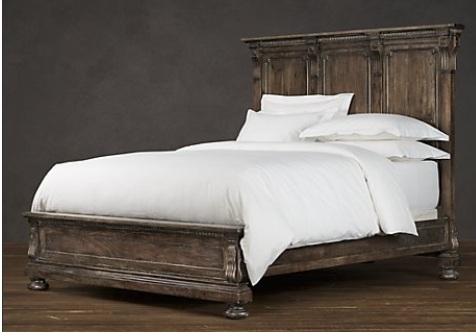 However, love the look of a bed with a footboard! If you do decide 'for' then get lower footboards. Another consideration is how far do they stick out? Someone (me) will always bark a shin or stub a toe in the middle of the night. I've considered removing the footer from our beds to make it more comfortable for taller guests. It means taking a saw to the bed, and I'm a bit worried that it would damage the structure of the bed. We bought a new bed frame since the old Hb/Fb had slots for the rails and then bolted the headboard to the new frame. The new frame is lower than I wanted - never though of it being that low - but it works and the guests do not need a ladder to get into this bed. IF you are going to have a footboard, go with that lower one. I have removed my last footboard - it is now a headboard for another bed. I am only 5'7" but I sleep with my feet hanging over the end of the bed. I whacked the heck out of my feet last year after DH had leg surgery and I slept upstairs so I would no hurt his leg. es, it also makes it harder to make the bed. Tall men love a bed with NO footboard.